From donating to the food bank to helping at shelters, there's no excuse not to give money or time. Courtesy Project Night Night Project Night Night delivers safety blankets to children in need. Courtesy Salvation Army The Salvation Army offers an abundance of opportunities to volunteer. Courtesy Birmingham News Food drives are an easy way to help the hungry. The holidays don't have to be entirely about gluttony and rampant consumerism. In fact, they shouldn't be. The Bay Area is undoubtedly experiencing a homelessness epidemic, and even though we live in California, it does get cold. Luckily, there are tons of volunteer and donation opportunities for people who are interested in helping their less privileged neighbors during the holiday season. Plus, remember that generosity can be as easy as handing warm food to the people whose tents you pass on the way to work every day. And, volunteering does not need to be confined to December. For even more volunteering opportunities, visit VolunteerMatch.org or HandsOnBayArea.org. The Society of Saint Vincent de Paul is a national Catholic nonprofit organization with several outposts across the Bay Area that does year-around work to support underprivileged communities with everything from free meals five days a week to vocational training and job placement. Between November and April, the organization also opens a Winter Shelter to provide emergency overnight housing to homeless Oakland and Emeryville residents. SVdP offers a wealth of volunteer opportunities that can either be a recurring commitment, or a one-off contribution. Whether you're sorting through clothes or serving food, there's dozens of ways that SVdP can help you make a difference. And because they have so many centers throughout the Bay Area, it's likely that you won't have to travel far to get involved. 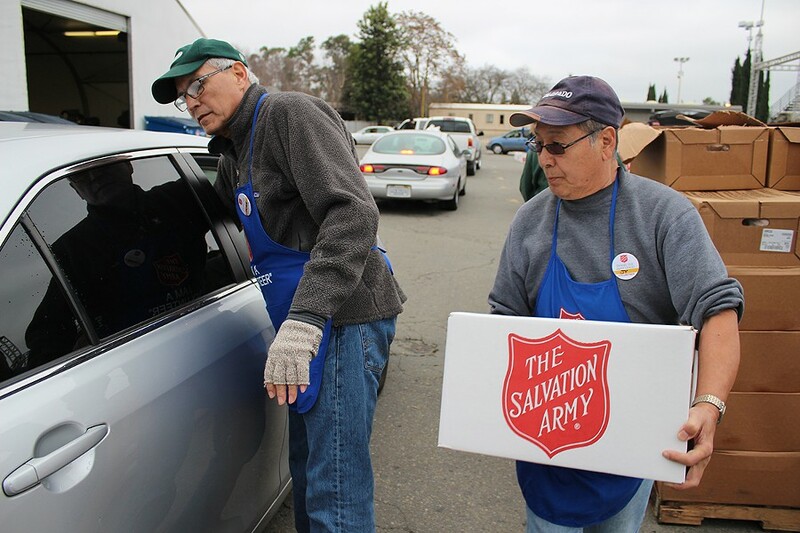 The Salvation Army is another nonprofit that could always use specialized, year-round volunteers. Current Alameda County volunteer opportunities listed on its VolunteerMatch.com profile include guitar instructor, resume workshop instructor, ESL teacher, bingo assistant, and many others. But it also asks for winter-specific aid. On various dates between December 14 and 21, the Newark and Oakland locations are seeking volunteers to work four hour shifts sorting Christmas toys. Then, from November 20–23, the Newark, Hayward, and Oakland locations need people for four hour shifts distributing those toys, as well as food, to low income families. Those with the musical spirit can also sign up to do "bell ringing," — collecting donations outside of stores in various locations between December 18 and 24. Project Night Night is a national nonprofit with a San Francisco office that aims to provide homeless children with some sense of security by giving out canvas tote bags carrying a new security blanket, an age-appropriate book, and a stuffed animal. The idea is that providing objects of comfort can help to reduce trauma and advance emotional and cognitive well-being. To donate, people can either mail or drop off new blankets, stuffed animals, and new or lightly used children's books (3100 Webster St., San Francisco). Or, those with more initiative can organize a drive in their community by ordering tote bags for $3.50 each, gathering a group of neighbors to fill them, then dropping them off at a nearby shelter registered with the organization. The One Warm Coat's mission is simple: "To provide anyone in need with a warm coat, free of charge." And helping the organization is equally as easy. Simply use its online map to see which of its dozens of Bay Area donation spots is closest to you, then drop off a coat (or a few) that you're no longer using. Or, those who want take the extra step can use the org's easy-to-follow guide to organize a coat drive. It's as simple as asking your holiday party — or punk show — attendees to bring along an extra jacket. One Warm Coat's ultimate goal is that, instead of throwing old coats away, it will become a widespread habit to pass them on to someone in need. Bay Area Rescue Mission in Richmond provides daily meals, emergency shelter, transitional living, job skills training, and more to people who need it. Opportunities to volunteer there abound, primarily cooking and serving meals or receiving donations in the organization's warehouse. During the holidays, the nonprofit also seeks volunteers to help wrap gifts, serve and cook special holiday season meals, plan and execute its children's Christmas celebration event, and register families to receive holiday food boxes. It's easy to sign up, and there are opportunities available every single day to contribute between two and four hours of your time. The Alameda County Food Bank provides food for distribution by more than 240 nonprofits throughout the region. It can always use volunteers — individuals or groups — to help sort, screen, and box fresh produce and non-perishable food. Or, volunteers can assist with the Emergency Food Helpline, which aids people in finding same-day food sources in their own neighborhoods. And, of course, the organization is always taking food donations. With increased demand for food during the winter seasons, hosting Holiday food drives is especially important. 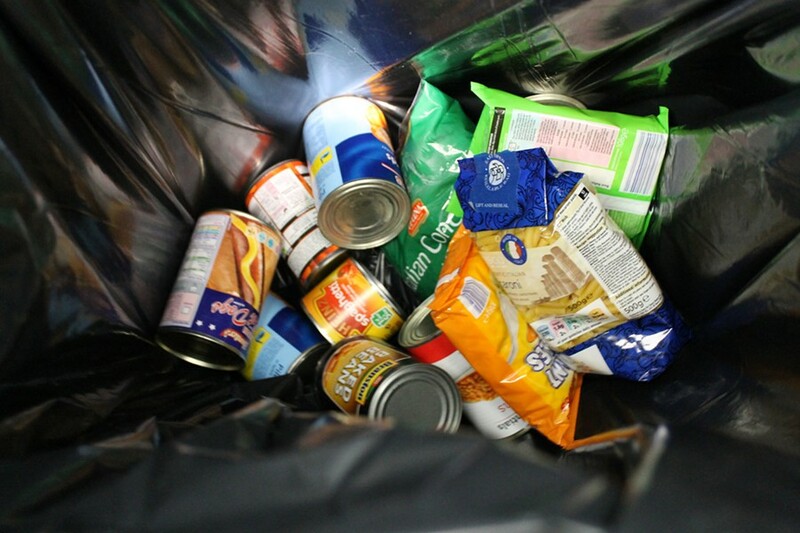 In fact, according to the ACFB, the 2016 holiday season may mark its highest demand for emergency food ever. Anyone can easily place a donation barrel in their school, workplace, or community center, simply by signing up online — the food bank will even deliver the barrel to your site of choice, if you need it to. For those who would rather rally their online community, it's even easier to host a virtual food drive. These work similarly to online crowd-funding campaigns. All it takes is a host, a set goal, and some online promotion. Contributors get to shop in an online store to decide what they'd like to contribute — whether it be seventy jars of peanut butter or 35 family meals. Virtual drives can also be set up as competitions, to maximize fun. Or, for those with little time to spare, individuals can of course donate on their own. And the best part about monetary donations to the food bank is that because of its wholesale buying practices, the organization is able to purchase $6 worth of food for every dollar that's donated.